A lover of fortuitous salt breezes, Katie has been sailing since she was 5 years old. She grew up on Pittwater with the only access to home being by boats. Katie comes from a sailing family, with both her parents sailors and her older and younger brother quite successful sailors too. At 16 she began Match Racing. A match race is a race between two competitors, going head-to-head. Match racers concentrate on crossing the line before their opponent. This one-on-one duel is a game of strategy, tactics and teamwork. Boats sail a windward/leeward course with a downwind finish. Races are approximately 20 minutes long. At the Start the two boats (each flying either a blue or a yellow flag) enter the start area from opposite ends of the starting line four minutes prior to the a shot sounded to commence. The boats will engage in pre-start manoeuvres, in which each one will try to gain advantage over the other. The aim is to make the other boat cross the line early or to start in front of the other boat. The yacht which crosses the starting line first has the advantage. During the Race the trailing yacht will tack to gain clear air; this usually results in a tacking duel. If the boats are even coming off the starting line each uses boat speed and tactics to get an advantage over the other. On the downwind leg, if the trailing boat is close enough it has the opportunity to block the wind and slow their opponent. The lead boat must work to keep its air clear while positioning itself between the trailing boat and the next mark. Katie is currently ranked 3 in the ISAF Women's World Rankings and a skipper in the Australian Women's Match Racing Team. 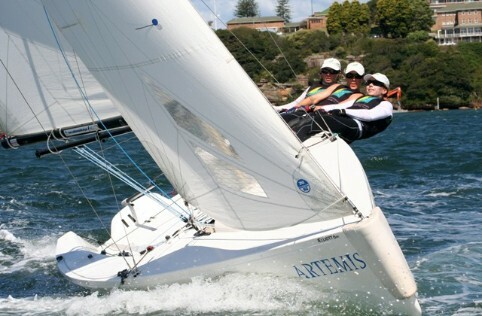 She hopes to lead her Match Racing Team to victory in London's 2012 Olympics. Winner of 15 major chamionships in Fleet Racing and Match Racing, Katie skippered her team to gold in Germany and Sweden in 2009 and again in Italy in 2010. 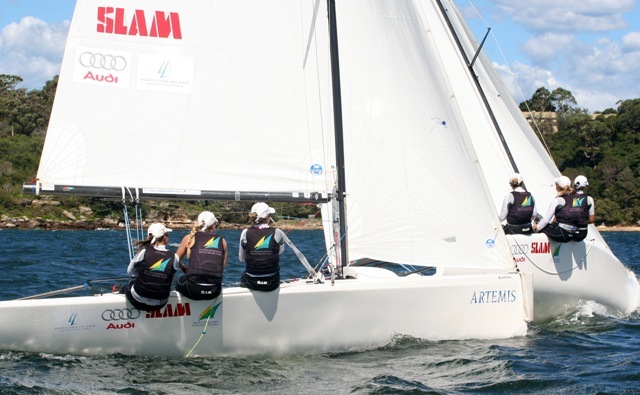 Six girls, including Kaite, form the Australian Team. 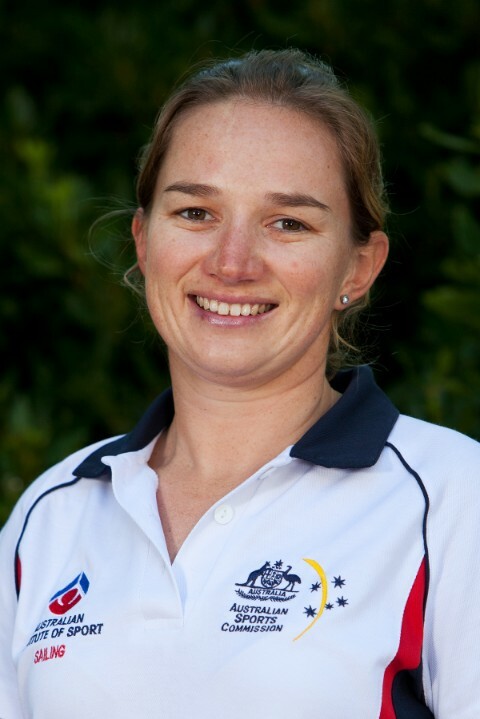 Now 29 years old Katie sails full time with the Australian Women’s Match Racing Team and is one of 6 females fighting for 3 spots for the London 2012 Olympic Games in the discipline of Match Racing (1 on 1 sail boat racing). Katie was married on Pittwater two and a half years ago and spends her time between Australia and Europe based on her training régime. Her husband is based in Sydney, also working for a sailing company. How long have you lived in Pittwater ? I was 6 months old when I moved with my family to Elvina Bay, we lived there for the first 16 years of my life, where my parents built our house, and I learnt to sail with my older brother and father. What do you like best about living in Pittwater ? I love the fact that when I am in Australia I can get up early and go out on the water for a paddleboard, or if I get a few days off we can go out on the cruiser and stay over for the weekend. Even in winter the weather and location is still fantastic. Where is you favourite place in the area and why? It is to hard to define my favourite place on Pittwater as there are too many of them. I got married down at Palm Beach at Lucinda Park on Pittwater, so that is a special spot for me and also Elvina Bay where I grew up. I am currently in Medemblik, Holland for my next competition and then have a few more months in Europe of competition and selection events leading into the final 12 months before the London 2012 Olympics. What is your 'motto' or creed for life ? Life is too short to wake up in the morning with regrets, so love the people who treat you right, forget the ones that don't and believe everything happens for a reason. If you get a chance, take it. If it changes your life, let it. Australian sailors have built on their strong starts to the fifth round of the ISAF Sailing World Cup with a number of good performances on day two in Holland sending crews up the leader board. Competitors were faced with conditions far removed from those on day one, with light breeze delaying racing and then testing the sailors once the action got underway. The Australian Women’s Match Racing Team crew of Katie Spithill, Jessica Eastwell and Lucinda Whitty has qualified for the repechage, round robin and a shot at the quarter-finals after a hard fought five races on day two. Copyright Katie Spithill, 2011. All Rights Reserved.